Published Dec 3, 2012 by Pearson IT Certification. Part of the LiveLessons series. Routers, without special configuration are susceptible to many types of attacks and misuse. By implementing a better than default security posture on the first day the router is deployed is a much needed first step in building a secure infrastructure for our data networks today. This lesson will assist in teaching you how to improve your initial security posture. There are many types of attacks that can cause our switches to be compromised, and act differently than expected. In this lesson you will learn how to control Spanning Tree using the BPDU Guard command, and mitigate a CAM table overflow by using the feature of Port Security. Using basic packet filtering can stop unwanted or unauthorized traffic, as well as protect against many types of network based attacks. 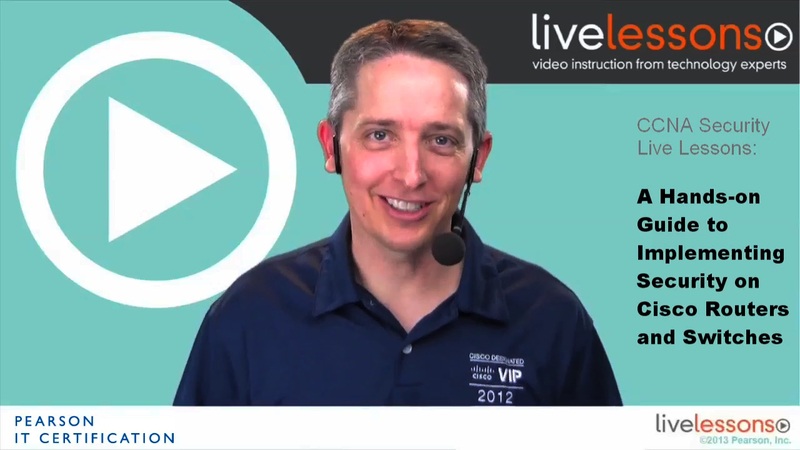 In this lesson you will learn how to create and implement both IPv4 and IPv6 packet filters. Stateful filtering firewalls are one of the most common, and useful firewalls today. In this lesson you will learn how to configure the stateful filtering feature called the Zone Based Firewall on a Cisco IOS router. The dedicated ASA firewall appliance is a purpose built network device that allows stateful filtering, NAT, VPN services and much more. In this lesson you will learn how to initialize an ASA, using its management tool ASDM, and configure and verify policy on the firewall. For small offices that don’t have the budget for a dedicated IPS appliance, the IOS IPS feature can be used on an existing router to add the functionality to the router. In this lesson, you will learn how to configure and manage the IOS based IPS. Connecting over an untrusted network such as the Internet has inherent security risks, such as eavesdropping. IPsec can be used to protect the data as it crosses public networks. In this lesson you will learn how to configure and verify IPsec VPN tunnels. SSL is a feature that is supported, by default, by most Internet browser software today. Levering the SSL, a VPN can be created to allow remote users to access their data over protected VPNs, offering similar functionality to IPsec. In this lesson you will learn how to configure SSL VPN support on the ASA firewall.